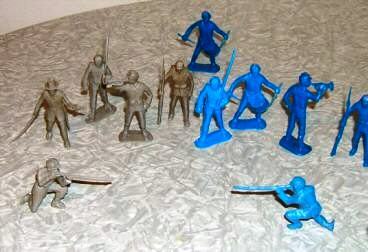 In some previous posts, I briefly discussed my childhood fascination with 54mm plastic “army men,” including Civil War toys. My collection included Marx, Timpo, Lido, MPC, Britains, and just about any other leading manufacturer of the era (as well as some oddballs that I have no clue now who made them). I occasionally received an allowance for doing my household chores and tasks, and once a week my parents would drive into town for groceries, banking, or shopping. I would spend the money on baseball cards, comic books, or on army men. The Marx figures were my favorites, and I frequently augmented them with other troops as money and availability allowed. One time, I was at S.S. Kresge’s and bought a bag of Timmee Toys Union soldiers. I took them home and added them to the army as a fresh regiment of recruits. Over time, I came to dislike them, as they were much taller and heftier than the Marx figures and stood out (they also made easier targets for my marble-flicking opponents). I never bought another bag. I finally decided they were from Minnesota and were former lumberjacks. The Rebels’ Poor Batting Average? On a foggy and damp morning in late June 1863, A.P. Hill’s Third Corps was marching through the Front Royal, Virginia, region. They were halted in by a massive traffic jam at the pontoon boats across the forks of the Shenandoah River. Soldiers were relaxing in a nearby field when a massive swarm of bats began darting and weaving just above their heads. Rebels grabbed sticks, rifles, bayonets, and anything else they could, and began swinging mightily at the diving bats. Bats chased soldiers; soldiers chased bats, and the field was soon filled with the spectacle of Hill’s finest engaged in a futile battle. Even General Hill and his staff joined in the merriment, as laughing soldiers tried to see who could knock down one of the swirling bats. 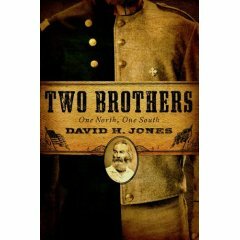 West Virginia author David H. Jones, a former U. S. Navy officer, combines his military training with his passion for writing in a new Civil War novel from Staghorn Press; Two Brothers: One North, One South. While I typically am not a fan of historical fiction, there have been a few works that I have liked over the years. Now, I will add Jones’ interesting story to that relatively short list. Unlike many quasi-historical novels that are poorly researched with glaring errors, Jones has skillfully mixed solid research with a creative and well-executed storyline. The end result is a wonderful book that captures the imagination of the reader, while intermixing enough history to be highly credible. The central character is the famous poet, Walt Whitman, who visits a military hospital in Washington D.C. and meets two brothers–one Union, one Confederate–who are patients in different wards. Through his compassion and tender care, the two opposing brothers are united through a common linkage, despite their inability to directly communicate. Although a work of fiction, the book draws the reader into the plot in a fashion that almost makes you believe the events actually occurred. Eminently readable with a good flow and timing, Two Brothers is a work you may have a hard time putting down. Unforgettable characters, set in the turbulent backdrop of Civil War America, make this work stand apart from the recent rash of historical fiction. It’s well worth a leisurely read. A few years ago, Rhode Island author Brent Nosworthy wrote an article for an early issue of my hard copy Charge! newsletter. He and I struck up a friendship, and I helped a little with his excellent Bloody Crucible of Courage book. Brent was kind enough to ask my counsel on a few matters for his new book Roll Call to Destiny: The Soldier’s Eye View to Civil War Battles, which will be in print in a couple of months. I helped proofread the manuscript and make suggestions on the Seven Pines / Fair Oaks and Gettysburg East Cavalry Field sections. In turn, he has been proofing my new manuscript, A Spirit of Daring: The Louisiana Tigers in the Gettysburg Campaign, and is writing the forward to my book. Trust me – Roll Call to Destiny is very good, in Brent’s usual analytical style. He covers nearly a dozen regiments at various fights, analyzing their tactics and results in the greater context of mid-19th Century military training. Pre-orders can be placed here. Mark your calendars! The second all-Johnny Reb ACW miniature wargaming convention will be held June 13-15, 2008, in Indianapolis, Indiana. Coordinated by veteran wargamer Norris Darrall, the convention will feature several Johnny Reb gaming sessions, using a variety of original scenarios and different terrain tables. JohnnyCon2 will be held at the America’s Best Value Inn, 5120 Victory Drive, Indianapolis, Indiana, 46203. The hotel’s phone number is 317-783-7751, and a block of 30 hotel rooms has been reserved. Call early. The rate is $69/night plus tax. If attendance / bookings >20 people, the rate drops to $55/night. If for some reason the 15 rooms are not sold, the rate jumps to $89. MENTION JOHNNY CON WHEN RESERVING YOUR ROOM!!! The point of contact is Mr. Surina Khanna. Mark Severin of Scale Creep Miniatures has opened a new retail store in Cincinnati, Ohio, that might be worth a visit if you live in that area, or visit Cincy on business or pleasure. The store is open on Monday through Saturday from 11 a.m. until 3 p.m., with other hours by prior appointment. Mark also sells his wares via the Internet. Mark writes, “And while SCM may be the smallest game shop you’ve ever seen, weighing in at a mere 240 square feet, we’re packed with miniature historical goodness! WW2, Old West, Napoleonics, Ancients, plus some cool VSF, boardgames, paints, dice and much more. We may be small but we’re mighty! So drop by if you’re in Cincinnati this weekend! Charles Kann has created a very interesting new website that might be of interest to those Charge readers who enjoy contributing to wiki-style sites. Entitled “Encounter at Gettysburg,” the fledgling website, once completed, should be a very useful resource for battlefield visitors.Eventually, Kann hopes to have all the major monuments listed, with photographs, background information, and, perhaps of most value, scalable Google maps giving the approximate location of the monument (standard view, satellite view, or hybrid view). Charge #18 to be mailed shortly! Debi and I are happy to announce that the hard copy version of Charge! has been printed and will be mailed on-time for an 18th consecutive issue. With our busy schedules, we are pleased to keep this streak alive, and commit to continue to try to get the newsletter out on the due date. Among the highlights are three new scenarios for regimental-level wargamers, including the Battle of Plum Point Bend, the Battle of Milliken’s Bend, and the Battle of the Crater. Other articles include a very nice treatise on canister from Tim Deichl, another article on painting figures by Andrew MacDonald-Rice, book and music reviews, and Doug Rogers’ review of the new Civil War Commander miniature rules. The newsletter is mailed free with your annual dues to the Johnny Reb Gaming Society. New improved website for Battlefield Terrain Concepts! Doug Kline has for many years been one of the mainstays of the Civil War miniature gaming community, with his excellent games and terrain, and his commercial venture, Battlefield Terrain Concepts. He is also the owner of the Johnny Reb Gaming Company (founded by Johnny Reb rules author, John Hill). Doug has created a brand new and vastly improved website for BTC. Why not have a look? Tell him you read about it in the Charge wargaming blog!